Please note, there is a change of schedule due to fires in the area of Downieville. The Bassetts Fire, as it's called has road closures that will make it both dangerous to ride there, and impossible to get to the trailhead. Downieville is off. Please check the rest of the site to see the schedule updates! Where: The Tahoe Rim Trail on Friday. On Saturday we have an optional ride on part of the Hole in the Ground Trail, then fun events/competitions at Donner Ski Ranch at the Donner summit. 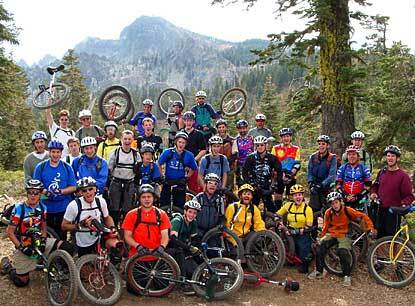 Sunday we plan for Mr. Toads Wild Ride in the South Lake Tahoe area. The mail-in registration deadline has passed. Don't put yours in the mail! Print out a copy of the registration form and have it filled in. The two most important parts are your signature on the release-of-liability, and hopefully exact change for your fees. I will try to collect as many of these as possible on Thursday evening and take care of money/other details if possible. I have rented two cabins to share in Truckee, which are basically full. Also, Lloyd Johnson is opening his home again, and I believe it is full as well. Camping and hotels are available right in Truckee, or in nearby towns. We are planning a Trials, and possibly a Street Freestyle competition. Other possible "fun" events are TBD. A sudden change in venue has us joining in with a fund-raising event at Donner Ski Ranch. Your registration fee will include dinner there. Non-registered people will be requested to buy tickets for a $40 donation. Look for more details about this event on the Saturday page. We will also do an exhibition for the crowd, using whatever performing skills people bring to bear. This will be separate from our Trials competition. There will be prizes from our sponsors, Unicycle.com, Bedford Unicycles and Kris Holm, as well as awards to give out at or around our Saturday dinner. Lake Tahoe is an alpine lake, nestled in the angle formed by the borders of California and Nevada. The border between the states passes through the lake, making its little turn somewhere in the middle. Tahoe is the highest lake of its size in the United States, with its surface at 6229' above sea level. It is also the third deepest lake in the country at 1645'. This still puts the bottom of the lake more than 3380' higher than the top of the Foresthill Bridge in Auburn, just 70 miles down the road. That's the highest bridge in California. The Foresthill Bridge is famous for base jumping, which is parachuting from the top! Also famous as background in many pictures from past MUni Weekends. Check this link for Truckee/Tahoe weather on various dates. The nights will be cold and mornings will be very cool. Be prepared! You will be riding at altitudes of up to 9000'. The whole Tahoe area is more than a mile above sea level. This means sunscreen if the sun's out! The air is dry, though it may rain (or snow!). In the Fall the area has usually gone for a long time without rain, so fire danger is high and the ground is very dry. Expect it to get very cold at night, and warm up swiftly during the day. You will probably need layers for the rides, so think ahead. If the weather stays nice it could be hot in the afternoons, or it may stay cool but still nice for riding. We did get snowed on in 2004... Remember to keep the high altitude and cold in mind when planning and packing. Water/sports drink. For the Friday and Sunday rides I recommend a hydration pack with water, plus a bottle of sports drink. All of our 2006 trails are very remote, so you've got to bring everything you need. Food. Your body will need lots of calories for the Friday and Sunday rides and there are no stores along the way, so be sure to plan ahead and have a good solid lunch with you. Powerbars alone will not cut it. Warm clothes/layers. Remember, we got snowed on last time we were in Truckee. Cell phone. You may not have coverage everywhere, but we got strong signals on the Tahoe Rim. It could be a lifesaver. Fun stuff! We'll be doing a bit of a show for the general public on Saturday, so if you have something you can do, bring it along! Temperatures may dip as low as the 20s at night. Daytime may be up into the 70s. Dress warm for after-hours, and in layers for the rides! Remember, weather conditions change fast in the mountains, so be prepared. Check local weather forecasts to get an idea of temperatures. Rides will likely start off pretty cool and then warm up a lot. Snow is not out of the question, as we learned in 2004. The Tahoe area is located along Interstate 80, northeast of San Francisco and Sacramento on the Nevada border. The nearest major airport is Reno, about 1 hour away, or Sacramento, about 2.5 hours away. Truckee a few miles north of the lake, with 80 passing right through.